Tamper proof labels are one to ensure that a product has not been tampered with or unauthorised inspection of the item has been made, as well as being a way of preventing a label being transferred from one item to another in an attempt to take or transfer ownership. There are two main types of security label which depending upon your particular requirements should work well. 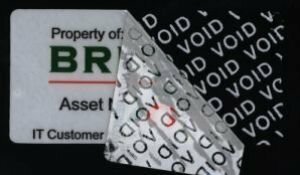 For warranty as well as label transfer there is the Tamper-evident ‘VOID’ label, which when removed, the word ‘VOID’ appears on the label. This makes it clearly obvious that there has been an attempt to remove the label. 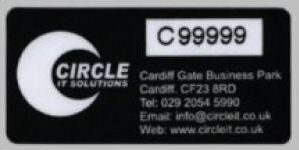 These labels would normally be manufactured using durable polyester and allows a variety of printing methods to be utilised, including barcode printing and full colour digital printing if the facility is available. The second kind of tamper proof security label is the tamper-proof destructible label, Should removal be attempted, it breaks up making it very difficult to remove. With this material any attempt to remove the label will result in this label breaking into very tiny pieces. A very popular label especially with schools that can be custom printed to your particular requirements with barcodes, sequential numbering, or even logos against a white background. They can also be block-printed in a colour if a plain white label is not what is required.